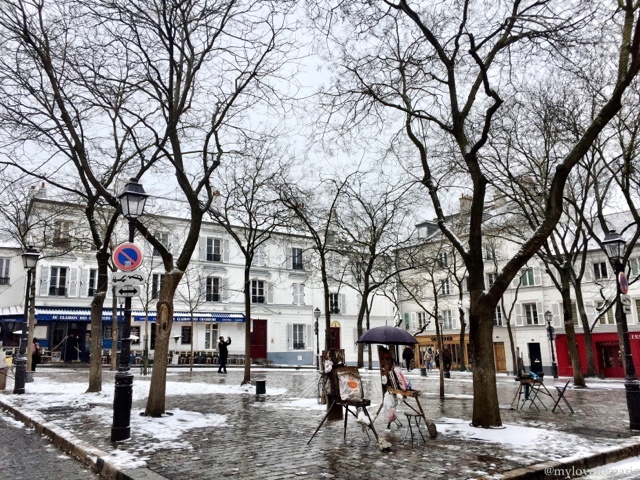 For the first time in my life, I was able to witness a breathtakingly snowy Montmartre last week. 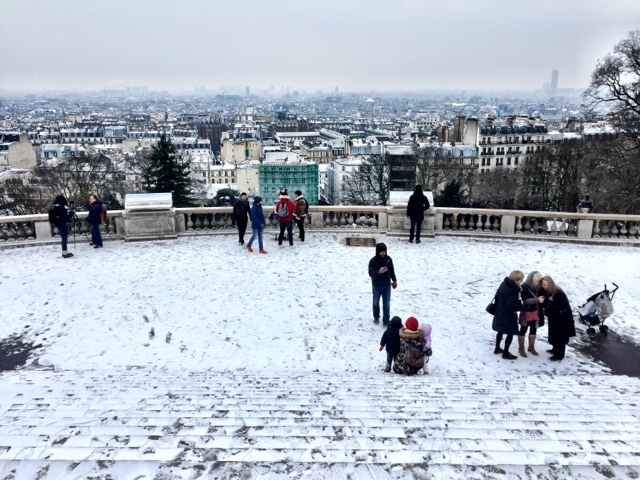 Snowy Winters aren't that much of a regular occurrence in Paris and even then, you need all these other stars to align in order to be in the right place at the right time. 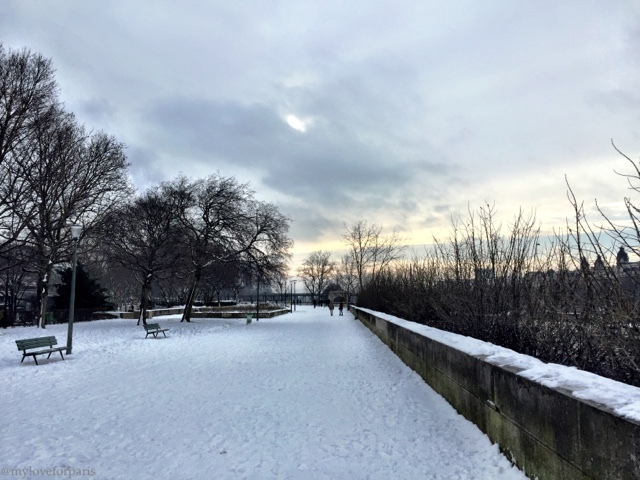 Not being snowed in, not having to go to work, not having to be anywhere and of course being able to get there before the snow turns into grey sludge are all elements to consider. 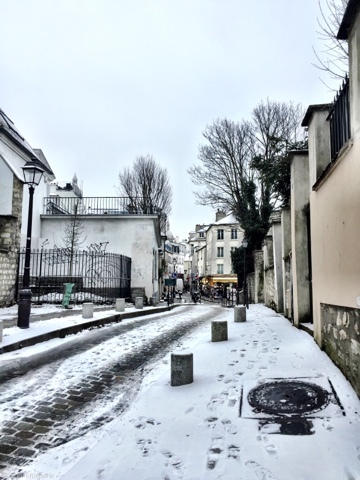 Hence why I haven't had this opportunity to see Montmartre in the snow since moving here in 2012. And then, there's the whole having enough energy to walk around in the freezing cold not being able to feel your fingers/toes/face. Minor issues of course. 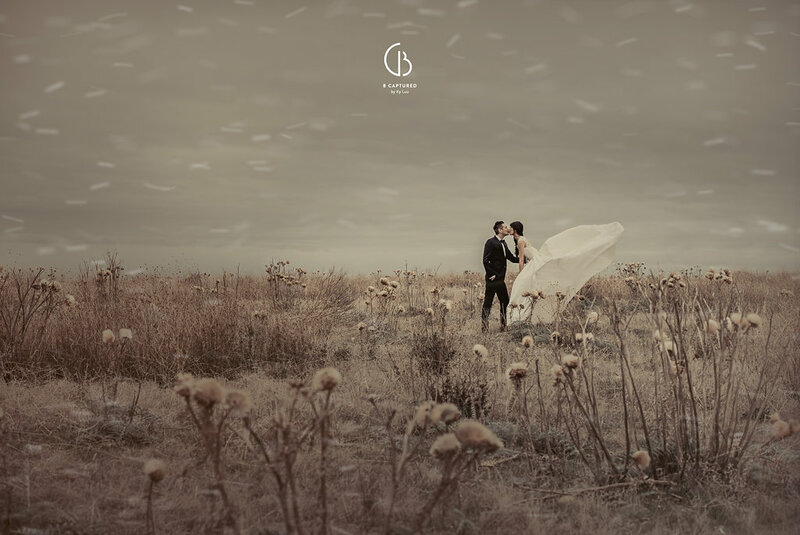 I wasn't going to let a little hypothermia/frostbite stand in the way of snapping these shots! 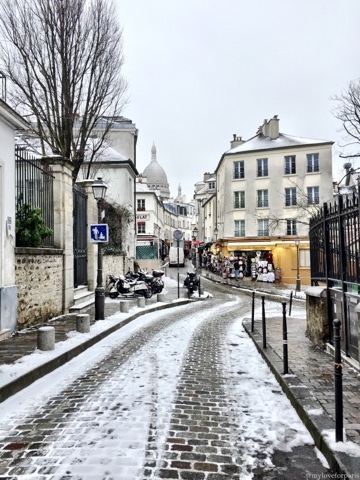 So please enjoy while I take you on a tour of early morning lightly snowed upon Montmartre (from the comfort of your warm room inside). Chez Eugene looking like it should be on a postcard or something, it looks strange all bare like that without a customer in sight. 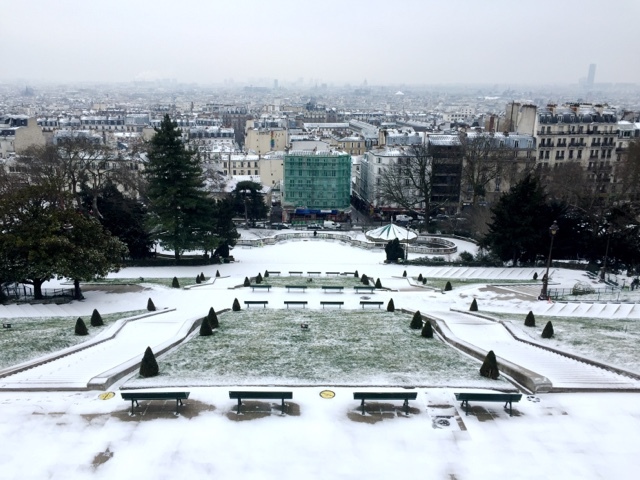 And of course Sacre Coeur and the lightly snowed upon lawns surrounding her. 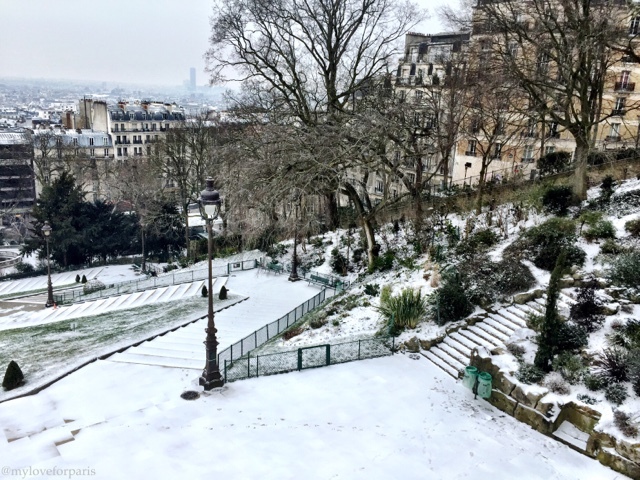 And finally in true Parisian fashion, the council decides to lock up the gardens (probably to stop people from skiing or snowboarding down the steps!). 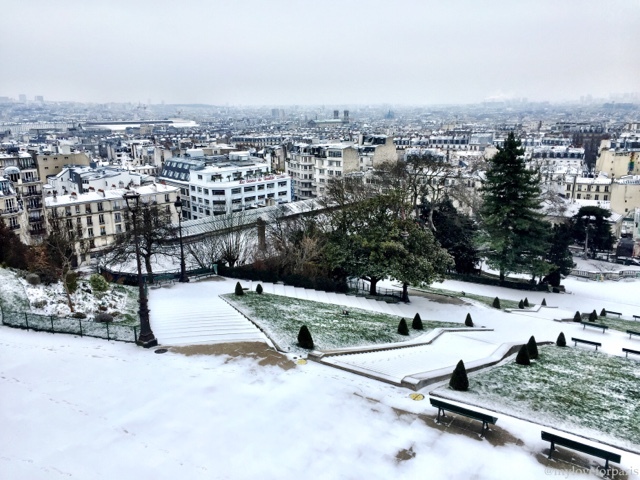 Not so great for those who want to roam around but beautiful for us to take photos of the untouched snow overlooking Paris (minus the footsteps on the left of whoever decided to jump the gates earlier that morning). 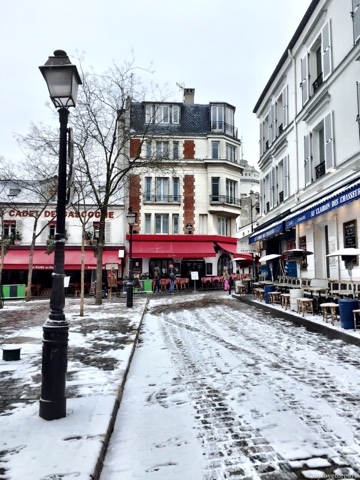 It's the first time I've seen this area of Montmartre like that, with nobody in sight. 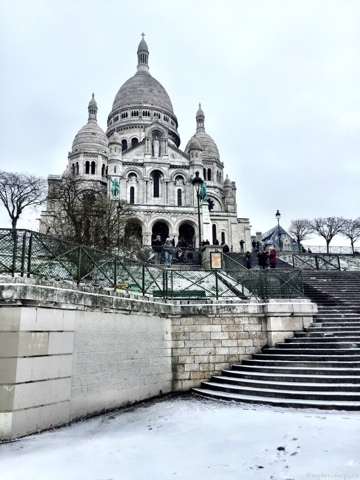 Because today, it's just Montmartre and I. 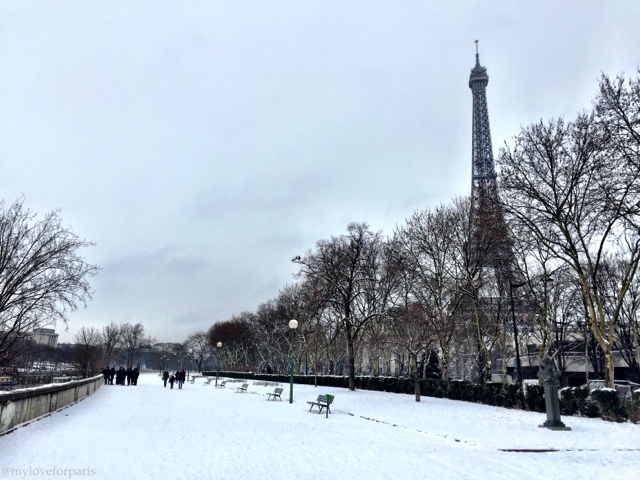 For the first time in 30 years, Paris welcomed its heaviest snowfall this week - a whopping 15cm! It might not be a lot for some, but for someone from Australia, this is the equivalent to an avalanche. A beautifully magical, surreal avalanche of the top things I love in life. 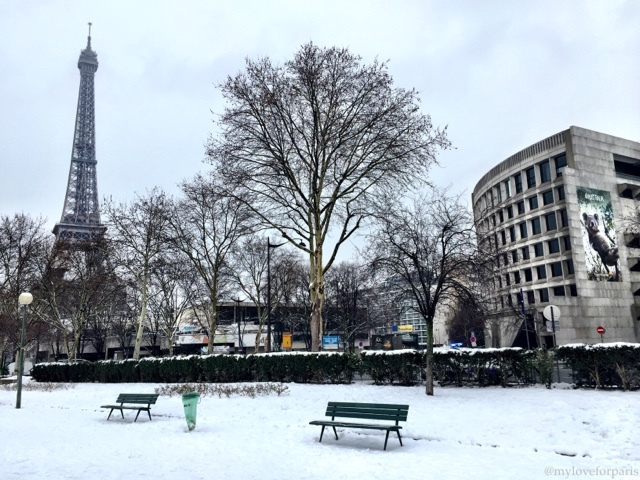 PARIS (obviously) and SNOOOOOOWWWW..!!! (if only my baby was with me on this walk, and my Mum, oh and Frenchie haha). Frenchie doesn't share the same level of extreme intense excitement as I do when it comes to snow. Each time we see snow, I turn into this hyperactive yapping puppy on caffeine/Red bull/stimulant cold and flu tablets. I'm literally running around everywhere - up and down the hallway of the apartment, unable to speak coherently and a speed that is comprehensible. My eyes are permanently wide open, I basically stop blinking because if I do I'll miss a nanosecond of seeing that beautiful image of magical snow. I'll jump up and down and repeatedly yell out "IL NEEEIIIIGGGGEEEE" among all my other uncontrollable excitable gibberish. 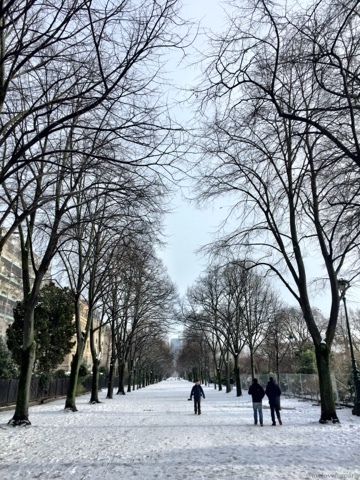 So anyway, back to the photos - please join me while I think out aloud on this walk to see the Winter Wonderland date that Paris took me on yesterday. Paris and I started off on line 6 - getting off at the Bir Hakim metro before crossing the road towards the Inception bridge. There I found a beautiful blanket of snow ready for me to lay my footprints on. This is the obligatory French-Australian shot, which is kind of funny because just last week I was in Australia battling 38 degree heat. I remember reassuring Frenchie "don't worry, we are in for a cool change tomorrow, it's going to be 35 degrees". 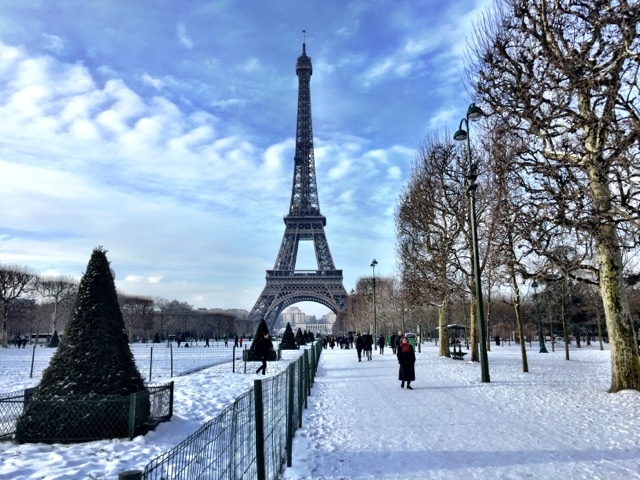 Fast forward to this week and we are in -4 degree weather and the heaviest snowfall in Paris since 1987..! I continue the walk further along and the snow stretches for as far as the eye can see. I'm struggling to keep calm in public at this point because my heart is literally singing. 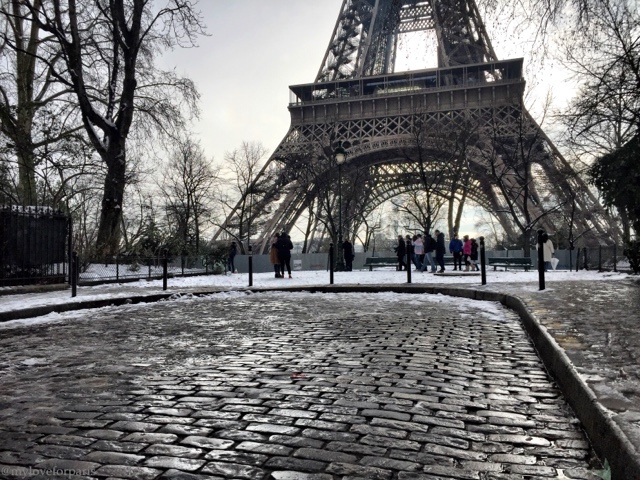 I walk towards the Eiffel Tower where the carousel is and glance back, to see THE SUN coming out from behind. I don't believe my luck...!! I cross the road past the carousel and reach the other of the bank and peer over to see this "interesting" scene. Little bird footprints on the pristine white snow, an annoying dockless bike just strewn on the ground like that (SERIOUSLY WHO DID NOT CONSIDER THE FLAWS OF THIS BIKE SHARING CONCEPT? What if some idiot just comes and pushes the bike into the river?) 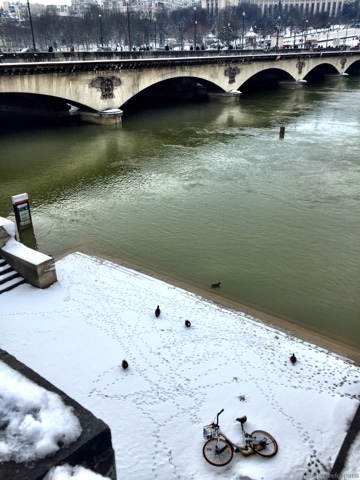 and of course, remnants of the overflowing flooding of the Seine. 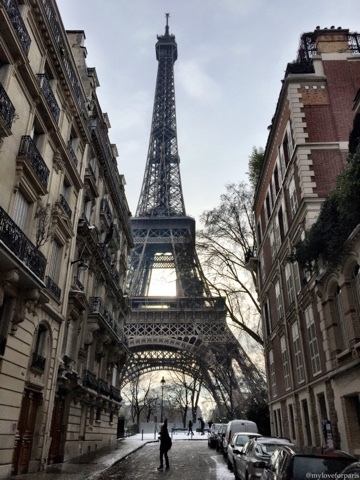 I walk along and eventually cross the road to make it to one of my favourite Eiffel Tower shots - rue de l'universite. There are others taking photos at this spot as well so I give up waiting for people to bugger off. The sunlight coming through highlighting every little detail makes this one of my favourite photos. I turn the corner and cannot believe my eyes, I am seeing shadows because the sun is so bright! It's this moment where I feel so blessed to be in Paris on this day, at this moment right as the sun decided to make an appearance. And then BAM - the battery on my phone decides TO DIE. I don't know if it was too cold or what but I desperately try to revive it. The day that I forget to bring my portable charger is the day it decides to kick the bucket at 55% - WTF? It briefly comes on for me to take this breathtaking shot. Maybe it's the universe telling me to just enjoy the effing moment instead of trying to document everything. My phone dies again and I am able to revive it one last time before it drops down to 1% for this shot. I put my phone in my pocket and walk away content to do as the universe suggests. 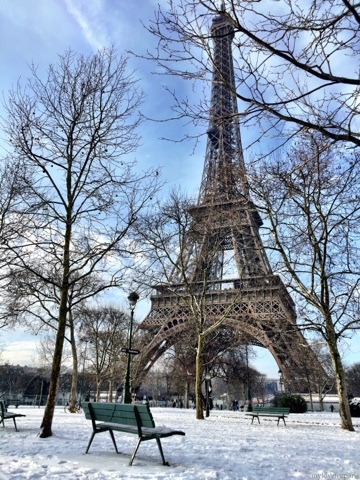 I mean, I am on a date with my beloved Paris after all, I should put my damn phone away! But not without a little selfie. I have never posted a selfie on the blog, actually I rarely take selfies on my own. But this occasion was a little different. Who knows if I'll be able to experience this ever again in my life. We've already waited 30 years for this moment, Paris and I..! 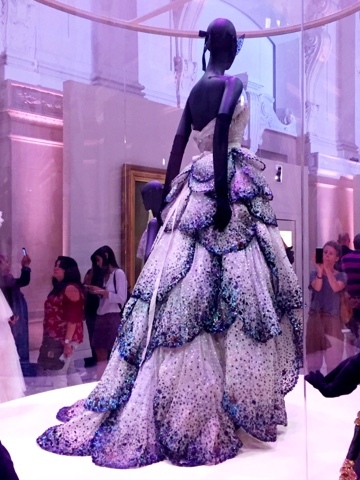 If there is one quintessentially Parisian exhibition to see this year, it is <Christian Dior, Couturier du Rêve>. 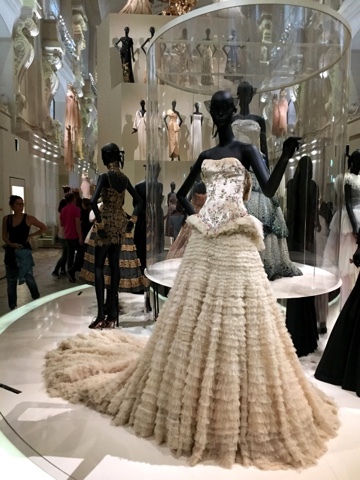 Currently on show at the Musée des Arts Décoratifs down the road from the Louvre, the exhibition is open until the 7th of January 2018. 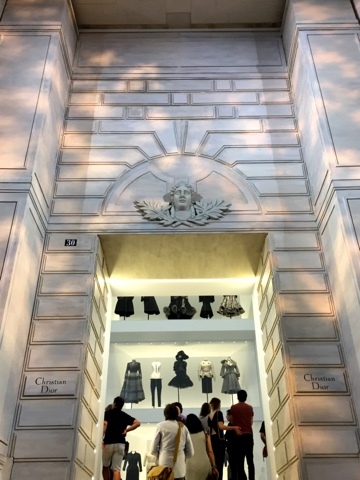 To celebrate the 70th anniversary of the House of Dior, the exhibition puts together over 300 Dior haute couture creations, accessories and objects throughout the years on display. 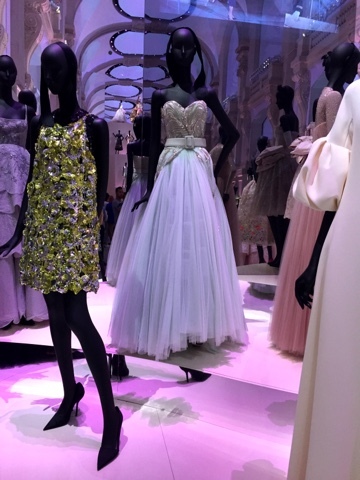 You will be taken on a journey through Christian Dior's life, his beginnings and rise to fame. 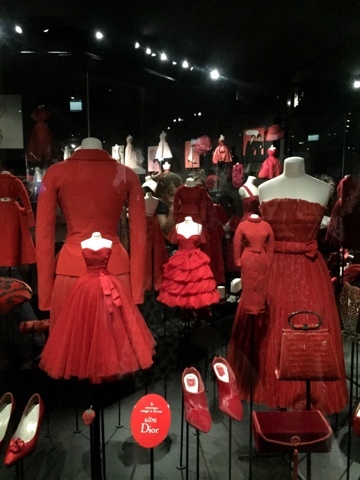 The exhibition is organised through different colour schemes, different eras (under each different creative director's personal style) as well as different themes. 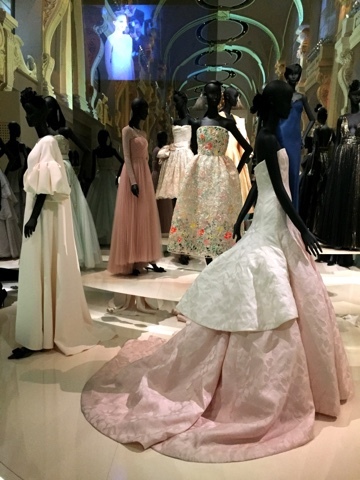 Start off your journey by discovering Dior through his favourite colour schemes..
Before moving on to showcase these gorgeous dresses by theme. 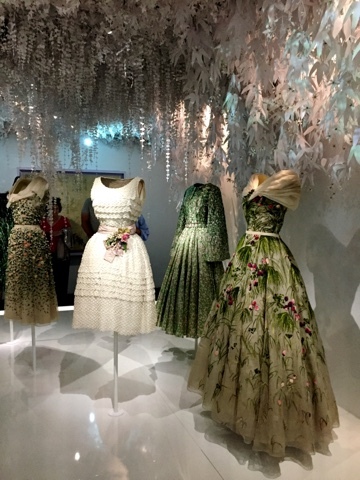 You'll be able to really see the contrasting influences of the individual styles of each creative director throughout the history of Dior. 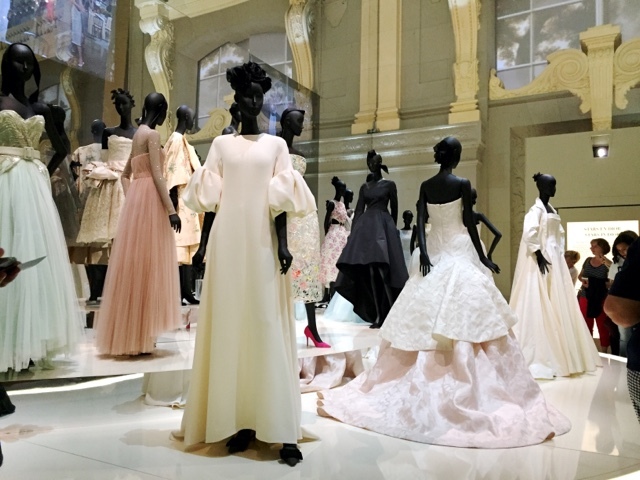 From Christian Dior himself to his successor Yves Saint Laurent, to Marc Bohan to Gianfranco Ferre. 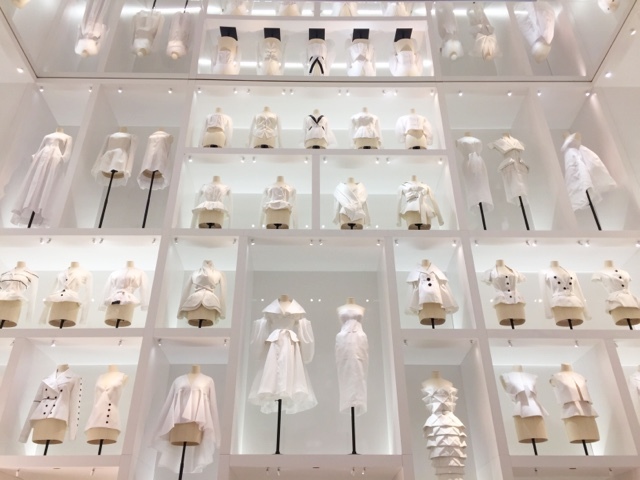 To the controversial John Galliano, to Raf Simons and then to the current creative director Maria Grazia Chiuri - the first female creative director of the House of Dior. 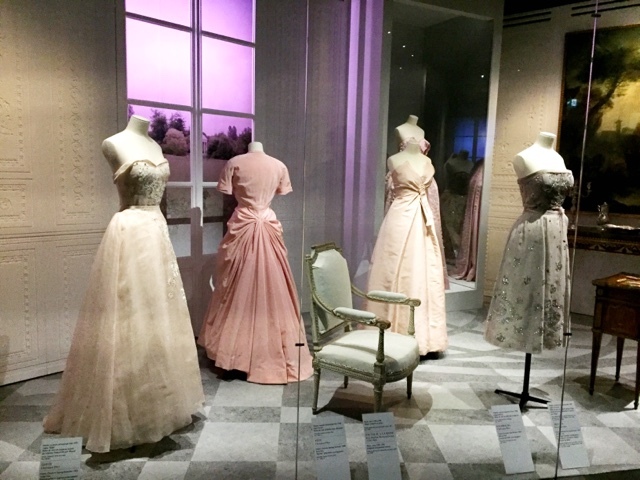 What I personally found fascinating was the history behind Christian Dior himself. The fact that he used to own a small art gallery that sold Picasso pieces back in the day. Or the story that back in 1919, at the age of 14, Dior met his first clairvoyant who told him that "you will be penniless but women will be good to you and it is thanks to them that you will succeed". 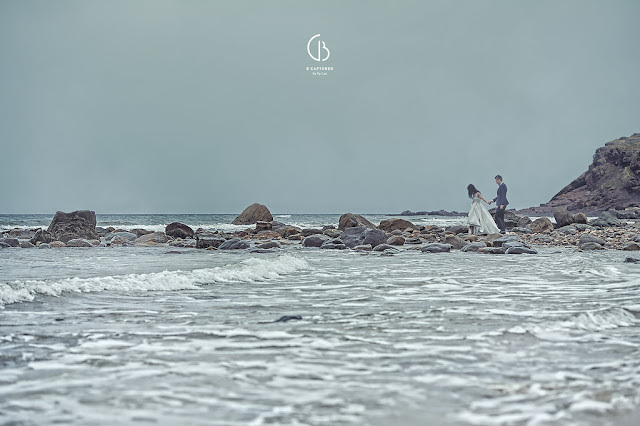 Having previously worked for LVMH and Dior in London when I used to live in London, I only knew too well the lengths we would go to in order to ensure the perfect product launch. 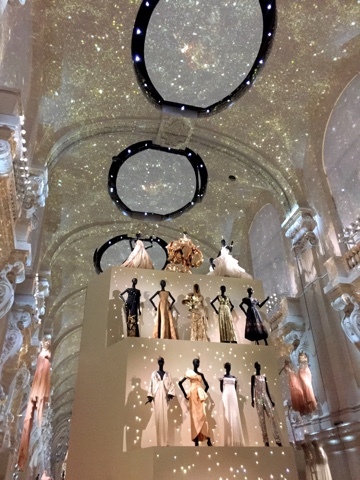 Every finishing touch had to be perfectly executed and this exhibition demonstrated exactly that. 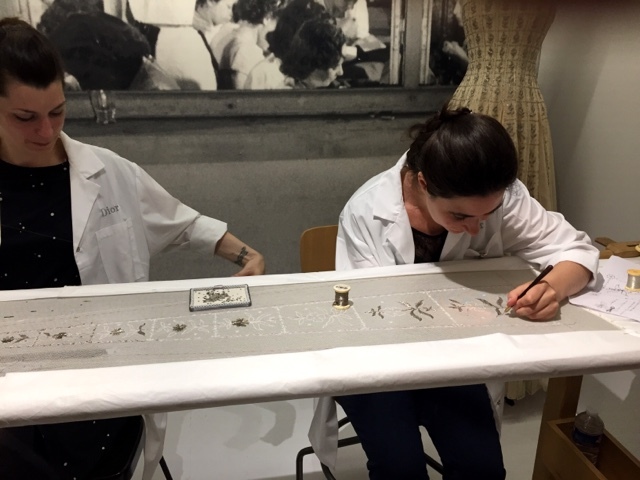 You'll be able to see how haute couture pieces are put together from the mock up to the intricate embroidery done by hand. The final room is the spectacular finale. If you don't want the surprise to be spoiled then scroll down for the practical information now! 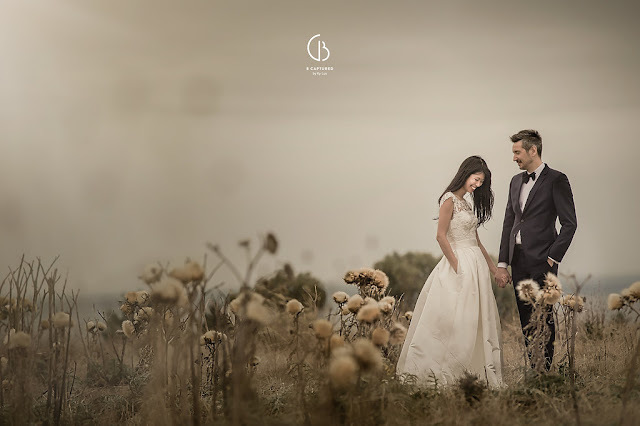 Butterfly inspired gown to take your breath away.. Et voila! THE exhibition of the year in a nutshell. Get in before it closes next month. I'd recommend to put aside a good couple of hours so that you don't feel too rushed (as the crowds can get frustrating already). Also, book online in advance if you can using the French website as the queues can get long if you don't. Also if you are under 26 and from anywhere in the EU you can get in for free otherwise tickets are 11 euro for general admission. Enjoy! As with many intercultural and interracial relationships, the balancing act is often played out like a playground see-saw and ours was no exception. We had already had the French wedding, now it was time for something in Australia. Of course the French side of our relationship has always been heavier. We had met in Paris, speaking Frenglish briefly before switching exclusively to French. Sometimes, it would teeter in the middle when we dropped by my Chinese-French relatives' place in Paris. We would all be speaking French together yet eating traditional home cooked Asian food. However for the most part it was me doing the integrating into his personal, family and social contexts - not to mention into his language, culture, traditions and country. Occasionally, the see-saw would tip itself over to my side and Frenchie would have to integrate into my context for a change. When my bubbly Australian friends visited, when we travelled to Anglophone countries, when we stayed with my friends and of course, this exact moment when we travelled to Adelaide. We held a mini cocktail reception where Frenchie probably learnt about 100 odd names in the space of 3-4 hours haha. 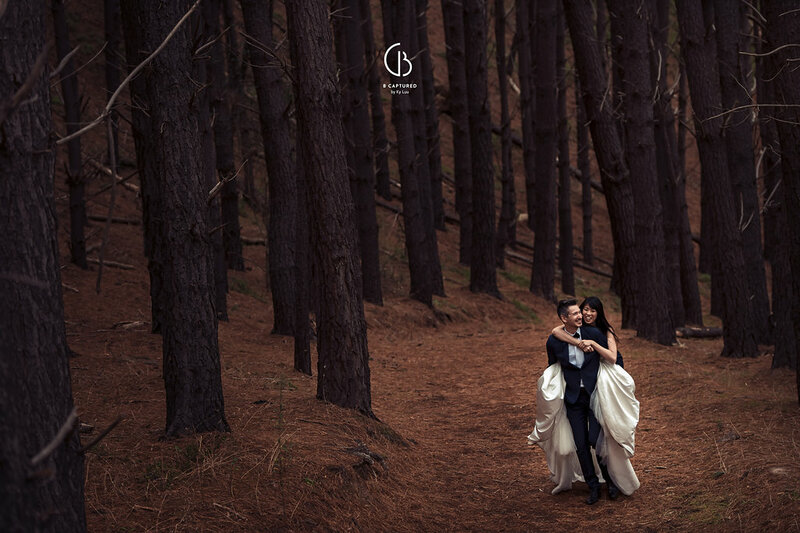 We were then fortunate enough to go on a wedding photo shoot (as a wedding gift) by the incredibly talented Ky Luu from B Captured. 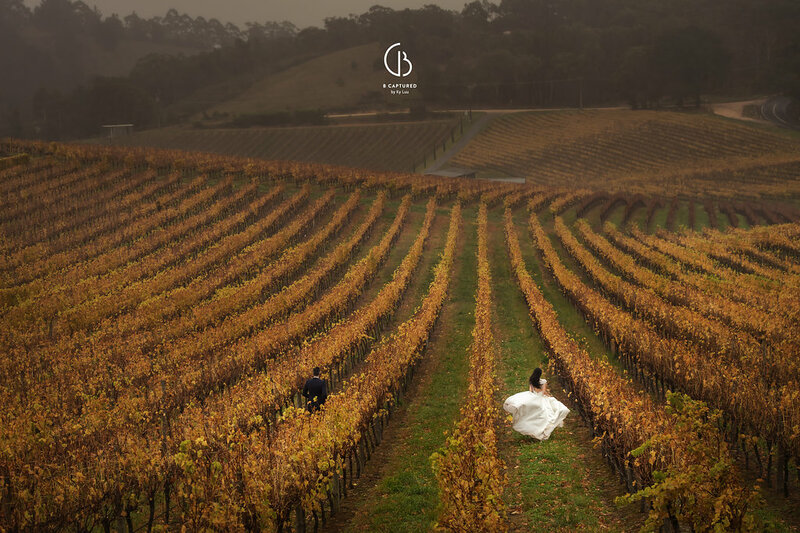 Ky is an award winning wedding photographer whose accolades include multiple consecutive titles of South Australian Wedding Photographer of the Year, AIPP Australian Wedding Photographer of the Year as well as 1st place Wedding Category International Loupe Award. 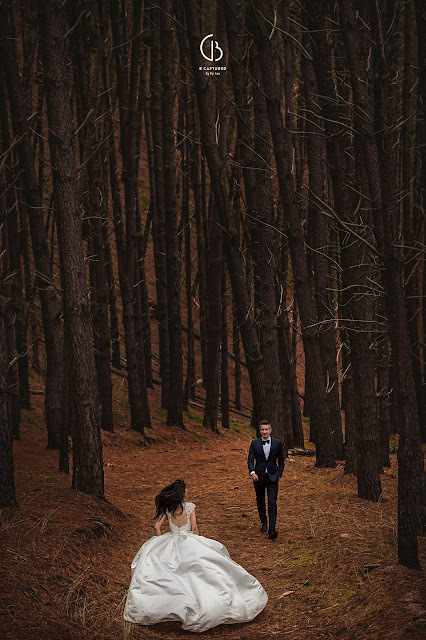 Ky took us on an exhilarating whirlwind tour of Adelaide's secret locations. 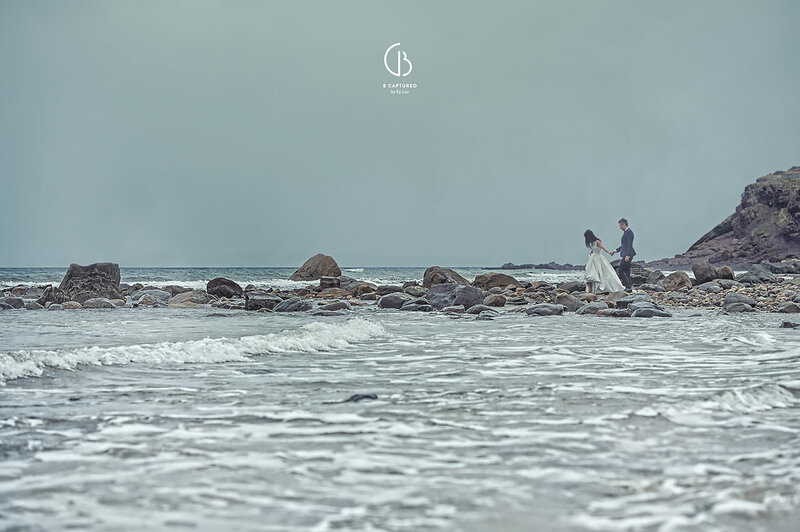 His passion for photography was evident from the get go. 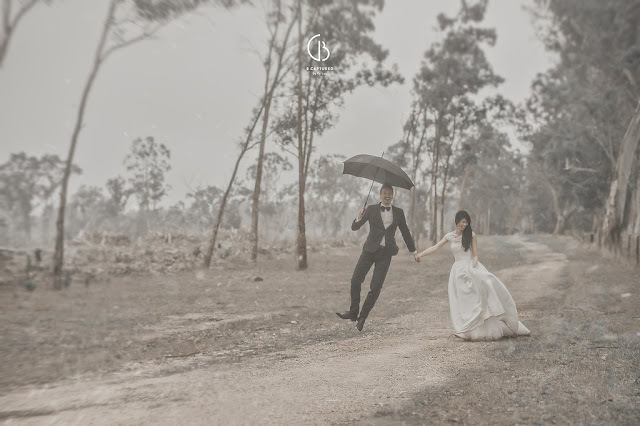 He would be jumping to stand on his car in the rain, lying on the ground, climbing up trees, doing absolutely anything to get that perfect shot. Such dedication and passion and relentless effort present at every single shot. If only I could have flown him over to Paris for our French wedding back then..! Anyway, here are some of our favourites to share of my hometown Adelaide. 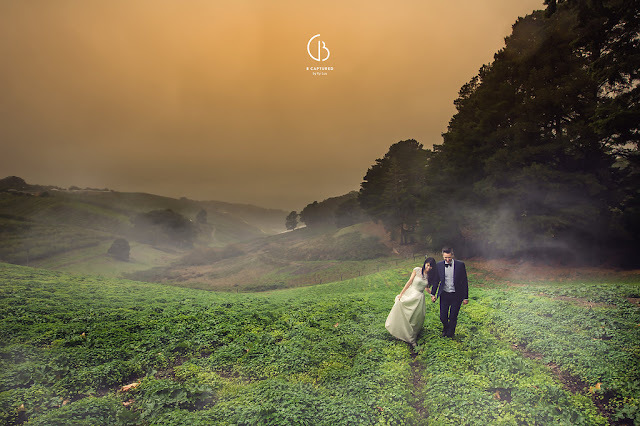 Abandoned fields, dramatic rock faces and cliffs, enchanting forests, sweeping vineyards, rolling valleys and long stretches of rhubarb bushes. 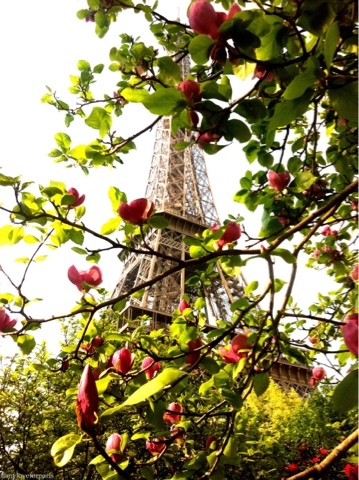 Spring has sprung in Paris..! 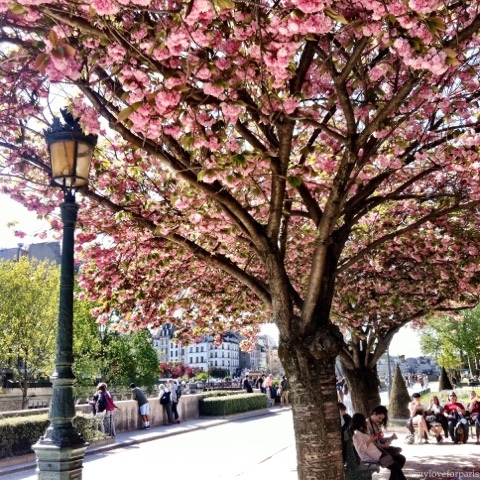 Probably my favourite time of the year in Paris, Spring has this magical fairy tale effect on the city, like we needed yet another reason to be swept off our feet hey..? Blush pink cherry blossoms cover the skies, beautiful magnolias bloom from their branches, delicate little petals resembling rose pink snowflakes cloak the ground and the hint of warm sunshine and clear blue skies gently awaken us from our Winter hibernation. 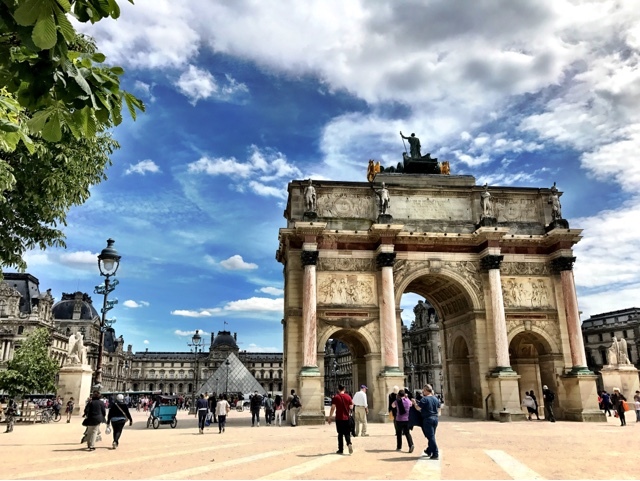 While there are many stunning places to visit in Paris during Spring, here are my top five unmissable recommendations. 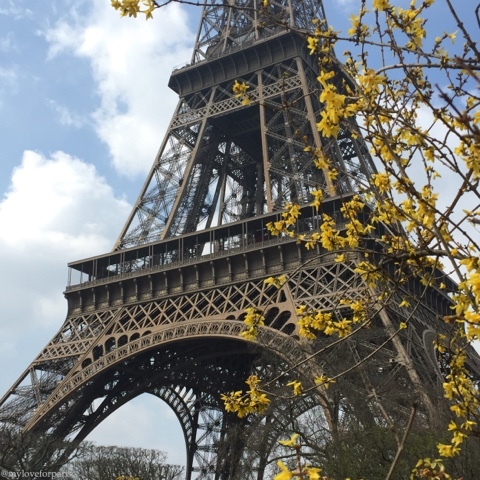 Sure it's been done to death but who can resist having one of these photos on your camera roll for a pretty Parisian keepsake...? 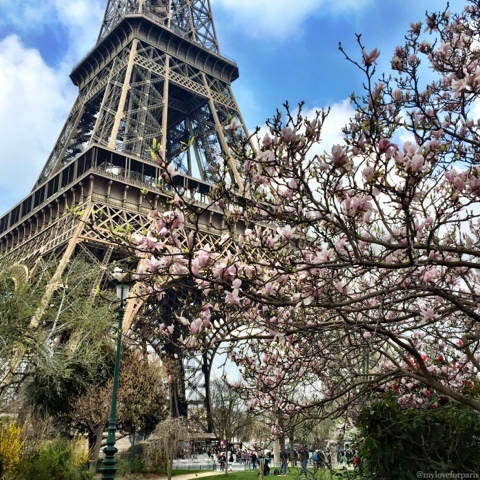 My Love for Paris tip: If you are facing the Eiffel Tower with the giant park behind you, head to the left side where you will find a big magnolia tree. There you'll be able to capture a shot like this from below the tree. 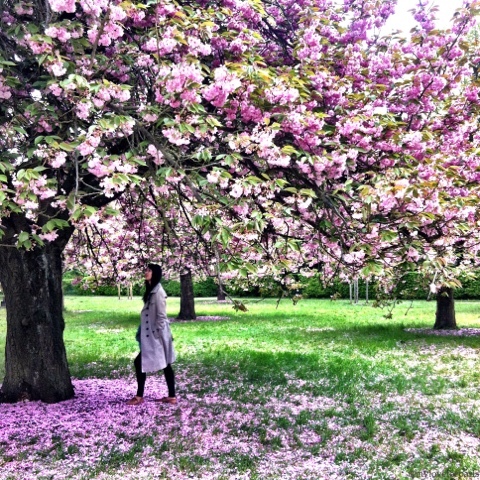 Head to the right from the same central position to find the other different coloured blossoms. 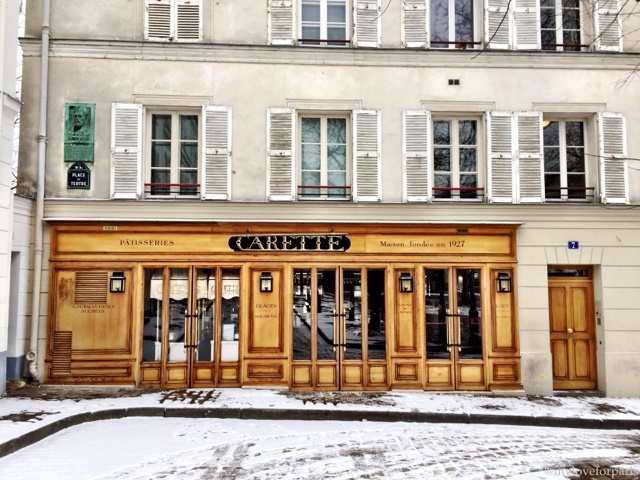 I've dedicated a whole blog post about this well hidden Parisian secret. 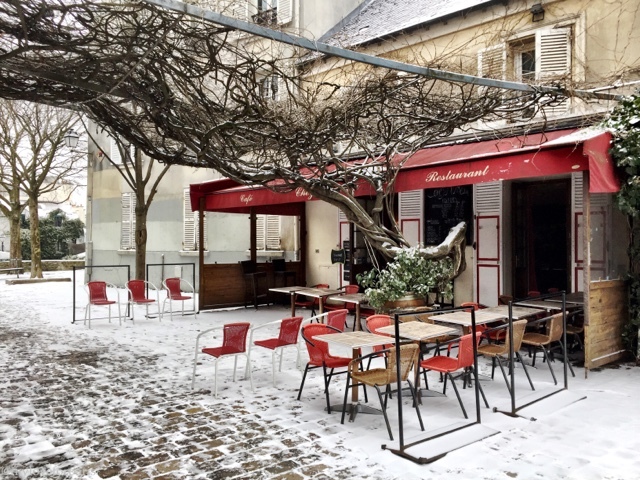 It is a little further out from central Paris but easily accessible by RER if you have a spare afternoon up your sleeve. Definitely worth the trek to see the cherry blossoms in full bloom. 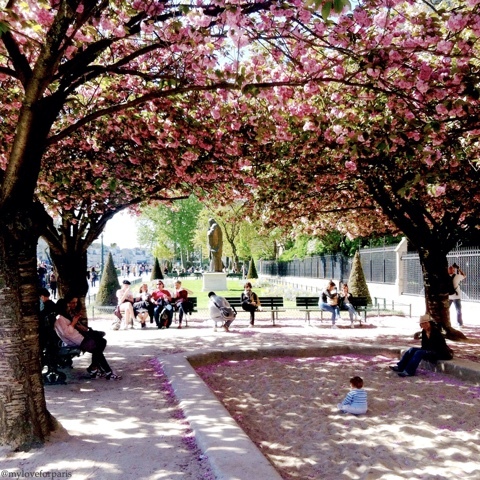 My Love for Paris tip: Drop by a supermarket and grab some picnic essentials to make the most of your afternoon amongst the cherry blossom trees. If you are directly behind the Notre Dame Cathedral, head to your left towards the water but don't cross the bridge just yet. Keep walking towards the front of the cathedral and you'll find a little sandpit and benches and a beautiful big cherry blossom tree to sit underneath. 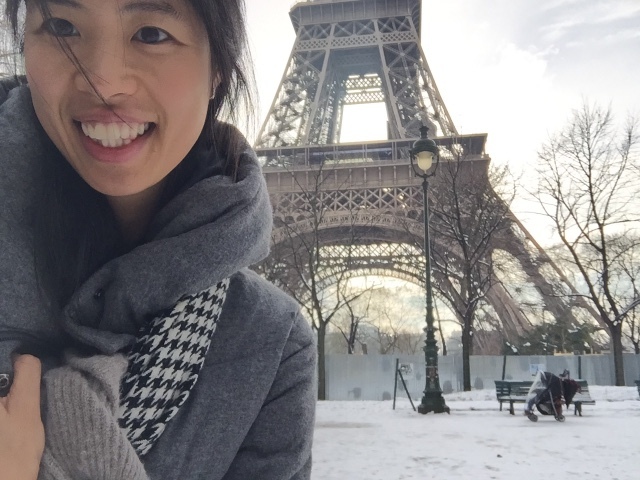 My Love for Paris tip: Grab an almond croissant (my favourite!) from your local boulangerie and shotgun a seat under the cherry blossom tree for some people watching - the kids playing in the sandpit are super cute to watch (in the most non-watching-kids-on purpose way of course..!). 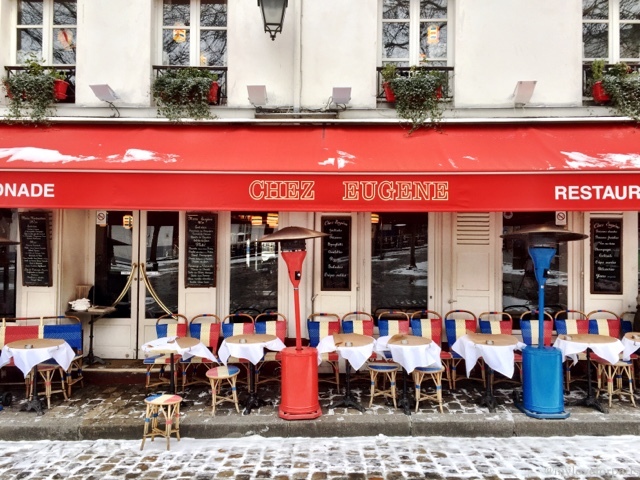 This was where we attended our very first Diner en Blanc event! 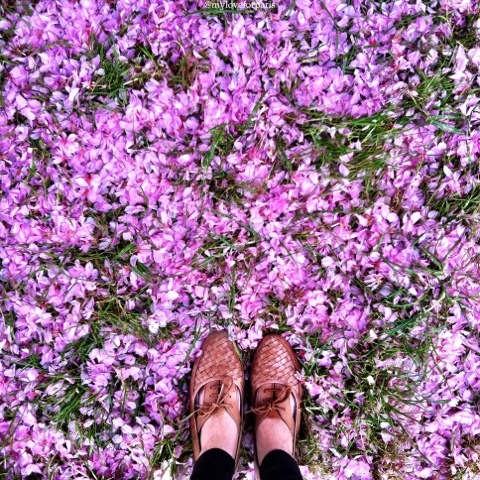 Magnolia heaven is all I can say. 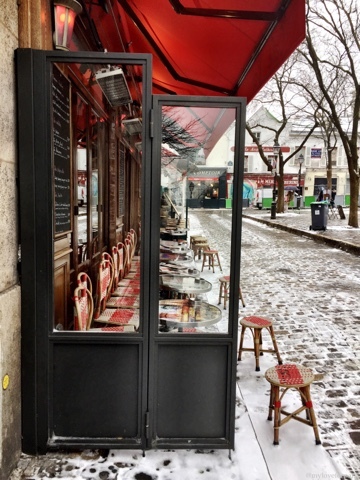 My Love for Paris tip: Bring along your current book. This place is much more peaceful with lots of seating available on the park grounds. 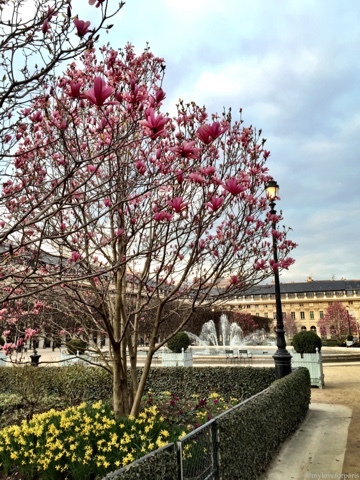 Escape the crowds, opt out on the people watching from above and just enjoy a quiet moment under the magnolia flowers to yourself. 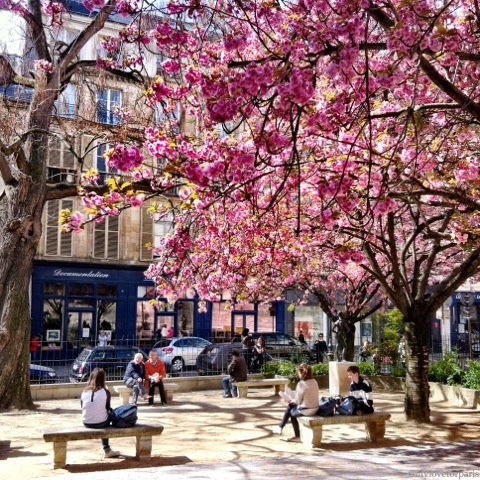 And finally, another cherry blossom spot in Paris. This one you'll be more likely to find locals than tourists. 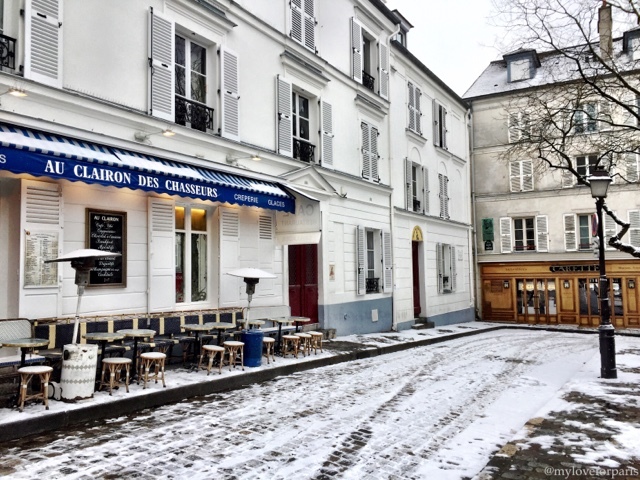 My Love for Paris tip: Make the most of this spot by escaping the tourist dense areas and visit the surrounding Saint Germain des Prés quartier.